Sticky Earth Ceramics Cafe at Sticky Earth Ceramic Cafe01263 519642work ArtisanA café where you can design, create and paint onto ceramics in a spacious, friendly and relaxed atmosphere. Choose from a large variety of mugs, plates, bowls, animal figurines etc., and paint to your hearts content, after which we'll glaze and fire your creation. Suitable for all ages, absolutely no artistic talent required. We provide the paints, brushes and our friendly staff are on hand to give you all the help you need to produce a completely unique, personalised, foodsafe and dish-washer proof item. Alternatively just enjoy a freshly brewed coffee, tea, latte or cappuccino. Schools, youth groups and those with special needs are all welcome. 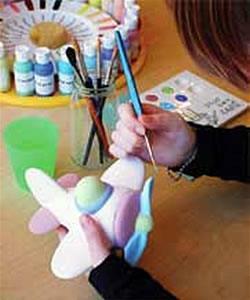 A café where you can design, create and paint onto ceramics in a spacious, friendly and relaxed atmosphere. Choose from a large variety of mugs, plates, bowls, animal figurines etc., and paint to your hearts content, after which we'll glaze and fire your creation. Suitable for all ages, absolutely no artistic talent required. We provide the paints, brushes and our friendly staff are on hand to give you all the help you need to produce a completely unique, personalised, foodsafe and dish-washer proof item. Open all year round, call for times.